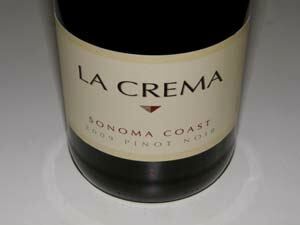 If you had to pick one California Pinot Noir label that year in and year out produces consistently fine Pinot Noir from multiple appellations at reasonable prices, La Crema would certainly come to mind. 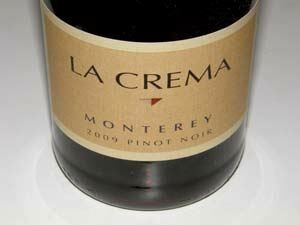 When neighbors, friends, and young people ask me what Pinot Noir to buy to take to a dinner, I often tell them La Crema. they usually thank me afterward, but La Crema is an easy recommendation to make. The wines are widely distributed (the winery website, www.lacrema.com, will help you find the wines close to home), with prominent placement on the top shelves of supermarket wine displays. La Crema Winery is a family owned estate in the Russian River Valley that specializes in handcrafted Pinot Noir and Chardonnay from cool climate vineyards in Sonoma, Mendocino and Monterey counties. Established in 1979, the winery has never allowed visitors (except for special events such as Winter Wineland), but the label quickly gained a reputation for quality. The owners are Laura Jackson-Giron and her sister Jennifer Jackson (family members belonging to the Jess Jackson clan). Several winemakers developed the La Crema Winery style through the years, including Dan Goldfield (Dutton- Goldfield) and Jeff Stewart (Buena Vista). In 2004, La Crema hired Melissa Stackhouse to oversee all aspects of winemaking, and the wines reached a remarkable high level of quality despite the relatively large production and value pricing. The popularity of the label has never been higher and La Crema is consistently one of the top selling restaurant labels. Stackhouse first joined La Crema in 2000 as an assistant winemaker. Before La Crema, her winemaking experience including stints at Peter Michael Winery, Hardy’s Tintara Winery in McLaren Vale, South Australia, Robert Mondavi, Sterling and Joseph Phelps Vineyards. She holds a degree in viticulture and enology from University of California at Davis. Recently, Stackhouse was promoted to Pinot Noir winemaster for all Jackson Family Wines, but will continue to be a part of the blending panel for La Crema. Elizabeth Grant-Douglas, who has been the assistant winemaker since 2004, will become winemaker at La Crema. Assistant winemaker Eric Johannsen is to take on the associate winemaker position at La Crema. Winemaking includes careful sorting, de-stemming, 5 to 8 day cold soak, aging for 7-8 months in about 25% to 30% new tight-grain, medium toast French oak barrels, and minimal fining and filtering. La Crema has supported sustainable farming since 1999, when they were among the first wineries to become a certified Sonoma County “green business.” 75% of La Crema’s vineyards are farmed using “non-tillage” practices to reduce carbon dioxide output. In all the estate vineyards, composted grape pomace and chipped vegetation are added to replenish organic matter. Habitat boxes in the vineyards for owls, bluebirds and falcons help to naturally control vineyard pests. Riparian areas that border vineyards are planted and maintained. Beneficial insects are introduced to eliminate the need for pesticides. I last tasted through the La Crema lineup of Pinot Noirs in the 2005 vintage when the wines showed beautiful balance and attractive textures but were more similar than different. With the 2009 vintage wines reviewed below, I discovered more appellation-specific character. All the wines can be recommended for early drinking. Prices vary widely depending on the retail source. Appellation-specific coastal region wines are produced from the Russian River Valley AVA, Sonoma Coast AVA, Los Carneros AVA, Anderson Valley AVA and Monterey AVA. 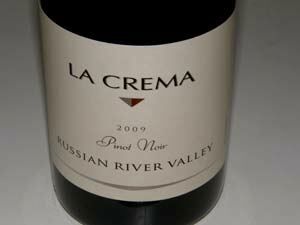 La Crema also produces an age worthy reserve small production (200 cases) expensive bottling labeled Nine-Barrel Pinot Noir which has received many accolades from the wine press. The La Crema tasting room, which is open daily, is located at 235 Healdsburg Avenue in Healdsburg. 13.9% alc., pH 3.74, TA 0.52, $24. Most fruit from a high-density planted estate vineyard in the Arroyo Seco appellation. Aged 7 months in 29% new French oak barrels. · Moderate reddish-purple color in the glass. Nicely perfumed with scents of black cherries, plum sauce, blackberry jam, spice and prickly pear. Well-structured and composed array of earth-kissed purple and black fruits with fine-grain tannins and bright acidity. A hint of oak-derived anise and dark chocolate add interest. Reminds me of Santa Lucia Highlands fruit. Soft and smooth in the mouth making the wine very inviting. A crazy good wine at this price. 13.9% alc., pH 3.70, $24. Clones 115, 667, 777, 828, Pommard, Martini, 2A, 23, Calera, Mt. Eden and Swan. Moderate reddish-purple color in the glass. 100% de-stemmed, cold soaked, open-top container fermentation, aged 7.5 months in 26% new medium to heavy toast French oak barrels, racked once out of barrel before blending. · Moderate reddish-purple hue in the glass. Subtle but attractive fruit-driven scent of an array of stone fruits and berries. Vivid and pure flavors of cherries and berries backed by sinewy tannins and offered with a softly textured mouth feel. The fruit is really quite charming and has that exotic edge often seen with Sonoma Coast bottlings. An exceptional value. Very good. 14.5% alc., $28. · Deeply colored. Highly perfumed with Bing cherries, strawberries and a touch of baking spice. Tasty strawberry and cherry fruit which is fully ripe and moderately dense. Soft and plush on the palate with supple dry tannins. Easy to drink and in character for the AVA. Good (+).